Presidents of several SUNY Oswego student cultural groups organizing the ALANA Student Leadership Conference meet recently in Marano Campus Center auditorium with former ALANA board member Quindell Williams (in red shirt), a class of 2011 graduate and now a photojournalist for CNYCentral, who led the first ever press conference to kick off ALANA’s nine days of events, Sept. 21 to 29, on campus. From left are Britney Underwood, Caribbean Student Association; press conference co-organizer Deja Daniels, music director for student-run WNYO-FM; Joyce Boadu, African Student Organization; Tenaja Smith-Butler, Black Student Union; Sally Familia, Latino Student Union; and Jewel Yeh, Asian Student Association. 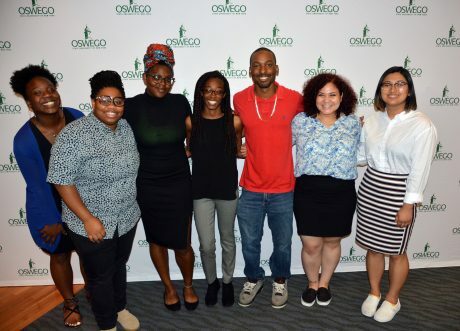 OSWEGO — SUNY Oswego alumnus and CNYCentral photojournalist Quindell Williams recently presided over the first ever ALANA press conference, crediting the multicultural series of events, his mentors and his work with student-run radio and TV stations with helping launch him on his life’s path. Williams said coupling his ALANA experiences with hands-on media work at WNYO-FM and WTOP-TV on campus inspired and informed his desire to become a photojournalist. “There are so many stories to tell that aren’t being told,” he said. Williams showed one of his stories, about Syracusan Arthur “Bobby” Harrison’s boxing program for youths. The 32nd annual African, Latino, Asian and Native American Student Leadership Conference — more than a week of events promoting cross-cultural understanding, education, networking, entertainment and storytelling — will open Sept. 21, with a 4:15 p.m. leadership panel in Marano Campus Center’s Room 114 and a 5:20 p.m. networking reception in the adjacent Hearth Lounge. The conference will conclude Sept. 29 with the ALANA Banquet. Among the numerous events in between are the ALANA Fashion Show; the Unity Peace Walk from City Hall in Oswego to campus; a keynote speech by 2013 alumna Sandra Michaca, an immigration attorney for the Piemonte law firm in Charlotte; a concert with the Korean band Coreyah; ALANA’s annual Community Service Day; and the Collections of Expressions show. Williams, who has earned two Emmy awards for his work on newsgathering teams at CNYCentral (WTSM, WTVH and CW), said it astounds him how the leaders of the groups under ALANA’s umbrella can arrive back at college in late August and, in less than a month, pull off the myriad details remaining to stage what has become nine days’ worth of events. Williams and his leadership group on campus worked with then-Oswego Mayor Randy Bateman, then-city councilor and ALANA mentor Cathy Santos and others to create the first Unity Peace Walk, designed to build lasting relationships between the greater Oswego community and college students, faculty and staff. 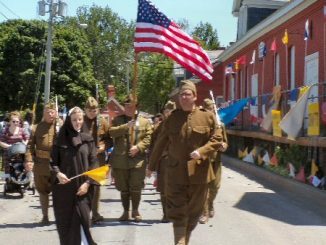 This year’s walk is the 8th annual — it starts at 3 p.m. Sept. 23, on the steps of Oswego City Hall on West Oneida Street — and the event has attracted more and more participants. All are encouraged to take part. “To see that still going strong eight years later is amazing, really cool,” Williams said. Formerly active in the African Student Organization and Caribbean Student Association, both helping organize the ALANA conference along with the BSU and others, Williams also noted how ALANA has grown. It also encompasses the Latino Student Union, the Asian Student Association, the Native American Heritage Association, the Gospel Choir, the Image Step Team, the International Student Association, the African American Males’ Empowering Network and the National Association of Black Accountants. * Fashion Show: 7 p.m. Saturday, Sept. 22, Hewitt ballroom. Tickets are $10 ($7 for SUNY Oswego students) and are available at Marano Campus Center box office, online at tickets.oswego.edu or by calling 315-312-3073. * Keynote speech: 7 p.m. Monday, Sept. 24, in Marano Campus Center auditorium, with Michaca offering networking opportunities to follow. * Coreyah performance: 7:30 p.m. (pre-concert talk 6:45 p.m.) Tuesday, Sept. 25, in Hewitt ballroom. Tickets are $20 ($5 for SUNY Oswego students, students at other colleges and all pre-college students) and are available at any SUNY Oswego box office, online at tickets.oswego.edu or by calling 315-312-3073. * Several presentations on Wednesday, Sept. 26: At 1 p.m. in 133 Marano Campus Center, “Finding Your Voice in Speaking Truth to Others,” Kevin White of the anthropology faculty, director of Native American studies and American studies; at 3 p.m. in 114 Marano, panelists present “Puerto Rico: A Report on the Island from a Cultural-Historical Perspective to Present”; at 6 p.m. in 144 Marano, a panel presents “A World of Opportunities with Aunree Jac Houston,” a 2000 Oswego graduate who is now the vice president of marketing operations for HBO programming sales. * ALANA Hosted Community Service Day: 11 a.m. to 6 p.m. Thursday, Sept. 27, at various locations on and off campus, with round-trip bus transportation provided. * Two presentations on Friday, Sept. 28: At 12:40 p.m. in 114 Marano, “Barracoon: A Discussion of Slavery and the Transgenerational Trauma of Racism”; and at 6:30 p.m. in the Marano food and activity court, the Collections of Expressions variety presentation. * ALANA Banquet: 6:30 p.m. Saturday, Sept. 29, Hewitt ballroom. Tickets are $15 ($8 for SUNY Oswego students) and are available at Marano Campus Center box office, online at tickets.oswego.edu or by calling 315-312-3073. People with disabilities needing assistance to attend should call 315-312-5430 in advance. Parking for ticketed events is included in the price, and is available in the employee and commuter lots behind Hart and Funnelle residence halls. For more information, visit oswego.edu/parking. People with disabilities needing assistance to attend should call 315-312-5420 in advance.